A visa is simply a document (often in the form of a stamp in a passport) issued by a government that authorizes a foreign citizen to enter that government’s country for residency, tourism, education and/or work. In most cases, you will receive a visa when you teach English abroad, but not always. There are many different types of visas and each government will have its own policies regarding visas and the ability of foreign citizens to enter that country for any of the aforementioned reasons. It is always important to understand what type of visa you will need to travel to any foreign country. The best way to learn about visa requirements to enter a certain country is to contact the embassy or consulate for that country in your home country. Embassy websites are typically an excellent source of information regarding visa requirements. Sometimes, it will be simple enough that all you must do is present your passport to be stamped upon entry at a foreign airport. In other cases, visas require a complex and lengthy application process that may require that you produce a variety of documentation in advance regarding your identity and your intentions to work, live, travel and/or study in the country to which you plan to travel. Note: While in most cases, a visa is required to enter a foreign country, there are exceptions, the most notable being the European Union – commonly known as the “EU” (or “E.U.”) – which is a political and economic union of European nations that enables citizens to travel freely, take up residence and work in other member states without having to get a visa, or even to produce a passport. Below are some brief explanations of different types of visas and some examples of how visa practices are applied in different countries. A tourist visa is typically issued to somebody who is entering a country just to visit as a tourist or a guest with no intentions of working, studying or establishing residency. In many cases, tourist visas are limited in duration to 90 days or less – it will vary on the country and on your own citizenship. Typically, a tourist visa does not provide legal permission to work or to reside long-term. Here are some examples of how tourist visas work in different cases. Often, a tourist visa is simply a stamp you receive in your passport when you arrive in a country at no cost and with no need to apply in advance. For example, an American flying into most European nations – like Italy, France, or Spain – just needs to present their passport upon entry and will receive a tourist visa stamp that gives permission to stay in that country for 90 days. In some cases, you will need to pay for a visa or pay a fee upon arrival in your destination. Americans traveling to Cambodia or Turkey, for example, will buy a tourist upon their arrival. The fee or cost of the visa is often $20-$25, though it can vary. For Americans traveling to Argentina, there is no need to apply for a tourist visa in advance, however upon entry Americans must pay a “reciprocity” entry fee of approximately $130 (this fee will only be charged once every 10 years per citizen regardless of how many times they enter and leave the country). Sometimes, you must apply for a tourist visa in advance of your travels to your desired destination. This usually entails filing some basic forms, along with a fee (can be anywhere from $20 to $120 or even more in some cases), passport photos and your passport to the consulate of the country you wish to visit in your home country. In such cases, a visa may take anywhere from one day to one month or more to process. Countries that require applying for a tourist visa in advance often include communist and former communist countries like Russia, Vietnam and China. Usually, the requirements and costs of getting a tourist visa in advance for such countries can easily be found on consulate websites. Citizens of countries in Africa, South Asia, Latin America, the Middle East and developing countries in Asia will almost always need to apply in advance, and even interview for tourist visas for entry into the U.S. and many European nations (as well as Canada, Australia and New Zealand). In some cases, proof of financial resources and/or proof of return travel are also required. This is due to the fact that there is concern in developed and economically prosperous nations that citizens of other countries will enter their country on a tourist visa and then attempt to find work and/or stay on permanently. Many Americans will enter countries like Spain, Italy and many countries in Latin America on tourist visas and then stay on and work teaching English. This is not legal, however it is so common as to be routine, it happens in the open and rarely if ever does an American in a country like Spain or Italy face any consequence at all for teaching English “under the table.” After 90 days the tourist visa expires and then the person has overstayed their visa. In other countries like France, Germany and Greece, it is not common for schools to hire teachers without work visas, so it is important to know the practices in each country. In many Central and South American countries, English teachers have 90 days of legal residence as a tourist and then they will cross the border to the neighboring country, e.g. Argentina to Chile. Once in Chile, the person is on a new 90 day tourist visa of Chile. A few days later the person crosses back to Argentina to start a new 90 day tourist visa. This is a common way to stay in the country legally. To learn more about teaching English abroad on a tourist visa, or without a work visa, read What Is Teaching English Abroad "Under the Table" Without a Work Visa? In most countries, there are legal requirements that foreigners working in that country receive a work visa or work permit that allows them to work. Requirements and procedures for receiving a work visa to work in foreign countries will vary greatly, but in 90% of cases, you must receive an offer of employment from an employer and this employer will be your sponsor. The employer will work with their government immigration agencies that will issue you a work visa or work permit. Each country has its own processes, requirements and quotas for providing work visas. In advance: In many cases, foreign workers must gain employment and apply for a work visa and get it processed in their home country in advance of their departure for their destination country. In the world of teaching English abroad, this practice is commonly applied to Americans and other foreigners teaching English in major Asian countries like Korea, Japan and China, and in the lucrative job markets of the Persian Gulf in the Middle East (U.A.E., Qatar, and Saudi Arabia for example). It is also possible for foreign English teachers to get work visas in advance in some European countries such as Turkey and Russia. Often to get a work visa processed in advance, the applicant must provide proof of employment, a passport and completed application forms; in many cases, other documents such as a copy of TEFL certification, criminal background check, medical forms and/or university transcripts or diplomas must also be provided. For an example of how this process works for one country, check out How do I get work visa to teach English in Korea? In-country: In other countries, foreign English teachers will gain employment in-country and then have a work visa or work permit processed locally. This is common for qualified English teachers who interview and get hired face-to-face in countries like Germany, Czech Republic, Vietnam, Thailand, and Turkey. Again, applicants often must provide proof of employment, a passport and completed application forms; in many cases, other documents such as a criminal background check, medical forms and/or notarized university transcripts or diplomas must also be provided. Those who wish to study for an extended period of 90 days or more in a foreign country will often be required to obtain a “student visa.” As always each country will have its own policies and requirements for student visas. Typically the primary requirement to gain a student visa is to provide proof of enrollment in a government-approved studies program at a university, institute or some other educational organization. In many cases, one must also provide proof of financial resources, health insurance and accommodations. Most people think of student visas in the context of “Study Abroad” programs at a foreign university for one or two semesters. For short term study opportunities of under 90 days – whether it be a one week cooking class in Florence or a four-week TEFL certification course in Barcelona – a student visa is not applicable or required. Student visas and teaching English abroad– What do student visas have to do with teaching English abroad? In some popular countries, such as Italy, France and Spain, it can be extremely difficult for Americans and other non-EU citizens to get a work visa; however, a student visa in these countries does provide legal working privileges, often up to 20 hours a week. This means that Americans who want to teach English in these countries can do so while on a student visa. International TEFL Academy has partnered with an accredited language school in Spain to develop special packages that will be offered to all International TEFL Academy students and alumni. These packages, which include Spanish and cultural classes to be taken over one year, will provide you with a student visa that enables you to legally live, study, and teach English in Spain for one year (and it is renewable). To learn more, please read Enrolling in Spanish classes and the Student Visa Program for Teaching English in Spain. at enable eligible citizens to travel and work in countries such as France, Italy, Germany and others. Those who are eligible for working holiday visas will need to apply for their visa in advance in their home country and will typically need to meet certain requirements including proof of health insurance, financial resources and travel reservations to return to their home country at the end of their visa. For more general information on working holiday visa programs around the world, check out this website. To learn more about the application process and requirements, please contact the consulate of the country to wish to get a holiday visa for in your home country. A spousal visa allows the wife/husband of a citizen on a work visa to live (and usually work) in their spouse’s country. Standards and procedures for obtaining a spousal visa will vary from country to country, but being married to a citizen usually makes it easier to live and work in a foreign country. Often when one family member gains legal employment in a foreign country, residency visas will also be sponsored for their spouse and children (“dependents”). While arrangements and regulations vary from country to country, such visas typically allow dependents to live in that specific country as long as the “head of household” has a work visa and may also grant rights to work and/or take advantage of social services, including public schooling and health care. 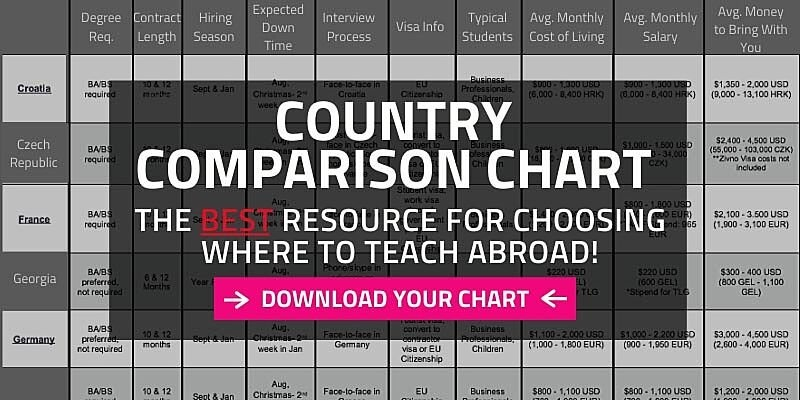 It is extremely important that you understand what your options and limitations are for your citizenship to teach English in a foreign country. Speak with an advisor at International TEFL Academy about your interest in teaching English abroad, TEFL certification options and the possibilities open to you.